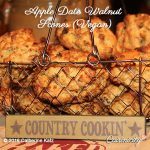 I love scones with a cup of tea on a blustery afternoon, or dipped in a cappuccino on an easy Sunday morning… and these yummy vegan apple date walnut scones just satisfy that little “indulgence” without the guilt! They have no added sugar! The sweetness comes naturally from the apples, dates (I use Medjool dates) and walnuts and it’s just enough! In fact, have decided to call my new line of Cuisinicity scones my trifecta scones (check my other 2 so far: Pumpkin, Raisin Walnut scones, Pear Fig Walnut scones and I have many more in mind that I am working on)! It makes sense: the definition of trifecta is “a perfect group of three” or ” winning three times” and that’s what all my wholegrain scones are based on: 3 wholesome main ingredients, one fresh fruit or vegetable, one dried fruit, one nut and I vary any one of them to create a new flavor. I am having so much fun creating these moist luscious scones and one more thing…they have no added sugar! 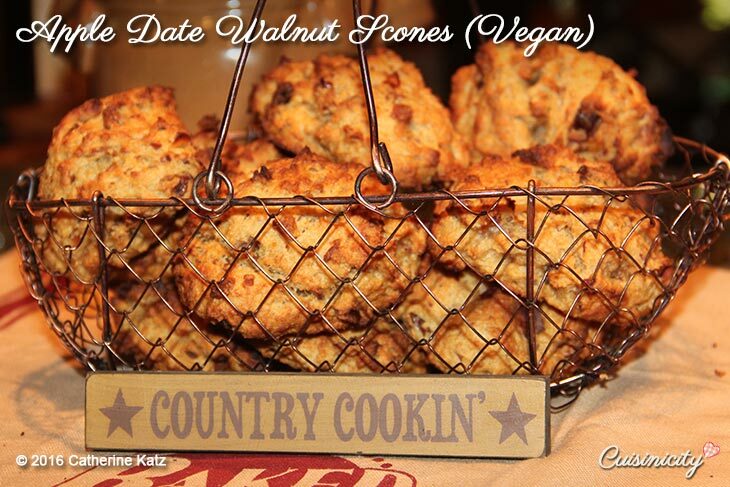 Watch me make them here in my kitchen right in front of you in less than 5 minutes! I use medjool dates, and take out the pits as needed, it's quick and easy to do, so you don't need to look for pitted dates. Place all the wet ingredients in the bowl of an electric mixer and beat for a couple minutes until creamy. Add the dry ingredients and beat again (it will form a very thick dough and that's OK). Scoop out the dough in large heaping spoonfuls, and place each scoop (you'll have enough for 10 small scones) on top of a baking sheet lined with parchment paper. Bake in preheated oven for 20 minutes until golden. 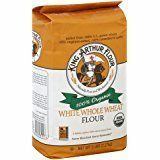 I like to use King Arthur white whole wheat flour for this recipe: it’s filled with fiber, yet is very light in texture! please fix the link to Cinnamon apples; when I click on the photo, nothing happens. Thank you! Thank you for this recipe. I just made it and think it’s great! Just a question: after I cooked the apples, there was about 1/4 cup liquid left. Should I have added the liquid to the scones? Interesting question Janet, because usually there is no liquid left after you cook the apples. So, I would say no. What did you decide to do? it sounds like it worked out beautifully for you anyway, but just wondering!